Home » Blog » Celebrities » Charities » Creatures » Popular Articles » UK » Emergency Rescue Mission to save 5 Cygnets at Hampden Park. 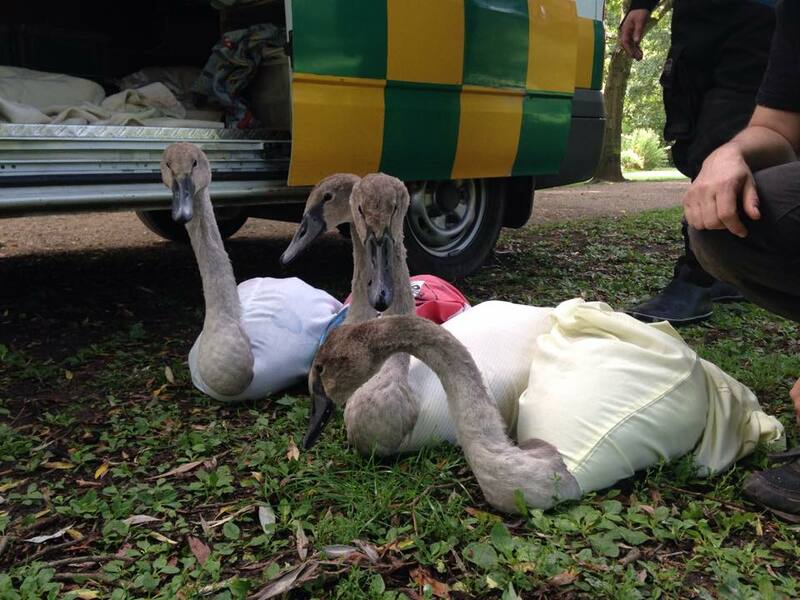 Emergency Rescue Mission to save 5 Cygnets at Hampden Park. Volunteer rescuers rushed to Decoy Pond, Hampden Park this morning after reports of lethargic swans in the water looking unwell. East Sussex Wildlife Rescue & Ambulance Service (WRAS) rescuers Chris Riddington, Kathy Martyn and Trevor Weeks attended on site with one of WRAS’s main Veterinary Ambulances. On arrival mum and two cygnets were near the bank, but the cygnets were showing little interest in eating the bread. “As Chris and Kathy kept the waterfowl distracted, I managed to creep up behind them and net one of the cygnets. I was expecting way more resistance and a much quicker reaction, but I caught him really easily. I was surprised at how light he was” said Trevor. Very quickly after Chris caught the second cygnet by hand from the bank. Being patient, rescuers waited for the cob swan (dad) to bring two more cygnets across to the inlet stream, where Kathy was able to catch another by hand. Trevor was then able to catch the fourth using a long handled net at the same location. Believing there were only four cygnet rescuers were about to leave when a fifth cygnet appear. This one took longer to catch but using patience Kathy again managed to catch the cygnet by hand. 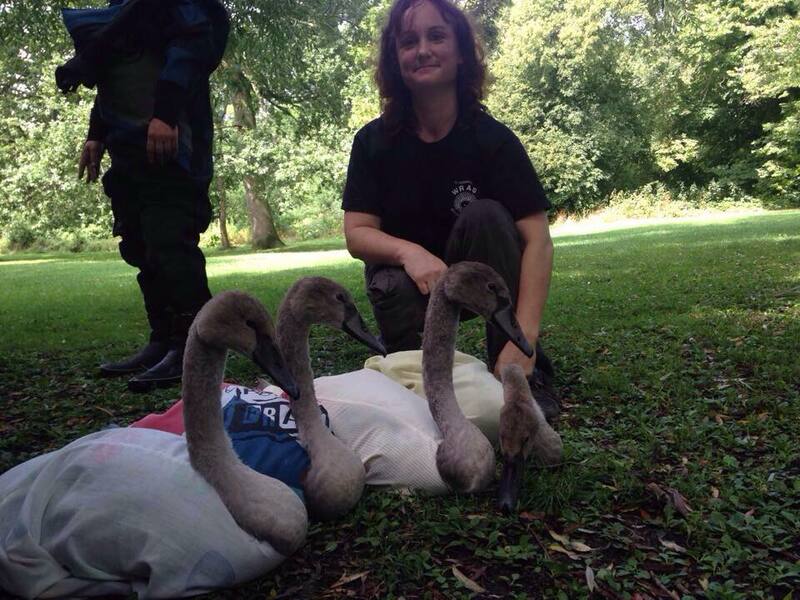 “You just shouldn’t be able to catch cygnets that easily, this made me very concerned for their welfare” said Kathy. Trevor checked the islands using a dry suit to ensure no other cygnets were present, before returning the cygnets to WRAS’s Casualty Care Centre for assessment. The lightest one was only 2.65kg and the heaviest 4.6kg certainly a lot smaller than they should be for their development stage. This is the third broad of cygnets in a row which have suffered problems at Decoy Pond Hampden Park, Eastbourne. It is believed the problem is being caused by a parasite which lives in the silt at the bottom of the pond. The parasite primarily affects swans which are filter feeders and reach lower down into the water and silt than duck can. The parent birds seem strong enough to cope with the parasite but every year cygnets are being lost to this problem. Last year Eastbourne Borough Council sent a dead cygnet off to the Swan Sanctuary at Shepperton for a Post Mortem Examination which revealed a very heavy parasite burden. 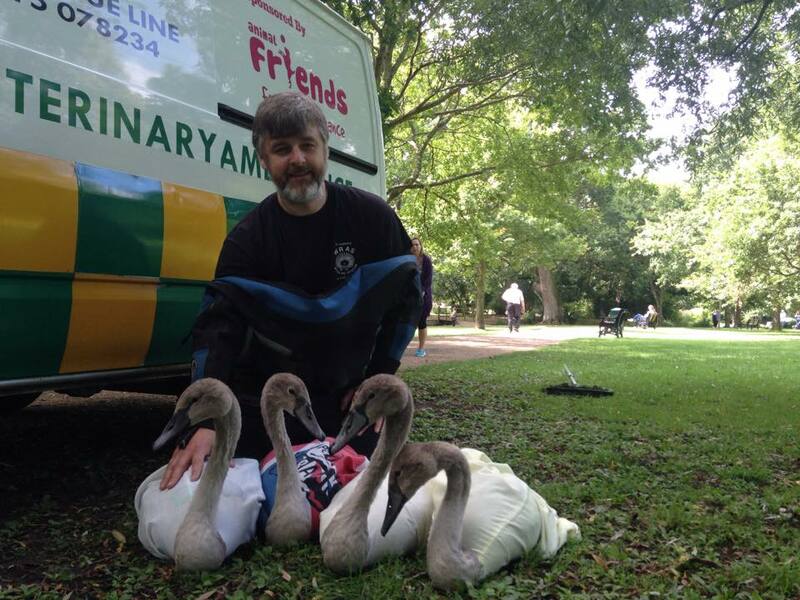 The sanctuaries vet requested that WRAS step in to save the remaining cygnets. Out of the remaining five cygnet one died at the sanctuary but the other four, after treatment, survived. Just over a week ago a cygnet was found dead at the pond, but the weight was not too low and cause of death was not obvious. However reports on Thursday night and this morning prompted rescues to assess their condition again today which resulted in their rescue and transportation to the Swan Sanctuary for urgent specialist veterinary care. “People have been asking us why we can’t step in sooner, but the problem we face is that we can’t legally step in until we have evidence that there is a problem with those actual cygnets or we could be committing an offence. However we are going to approach Natural England to see if it is possible to obtain a licence to step next year and catch them and assess them earlier on site with the help of our vet. Sadly the law which were designed to keep our wildlife safe also prevent us from being proactive in these situations at times, but as this is the third time in a row we hope this will add weight to our case” said Trevor. WRAS would like to thank Eastbourne Borough Council, local Councillors and the Friends of Hampden Park for their support and co-operation in looking after the cygnets at Decoy Pond, Hampden Park.